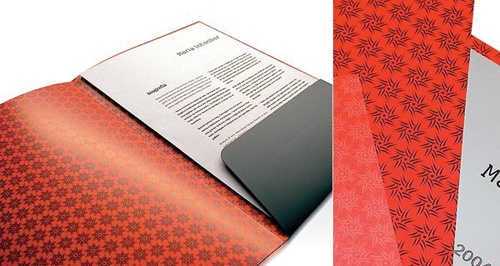 One of the basic ways for advertising a brand identity is through a presentation folder. Presentation folders are materials that are usually presented to the client to give an introduction about a company’s profile, services and other info. It is common that sales people are required to have this marketing collateral especially when dealing with clients. There are folders that are completely packed with inserts like brochures, business cards and a CD presentation; while some minimalist folders only show short details displaying their company logo, brief profile and contact numbers. Whatever a company decides on what to include in their presentation folder, it should always be clear and appealing to its target audience. It should also visually convey the message that your company would want say. Be sure to include only important elements and useful content. Corporate folders are often printed on thick, sleek card stock to give an initial impression of the quality. Message-wise, it should also depict the company’s purpose and relevance. For this article, we will showcase premium and creative presentation folder designs as a source of inspiration. The following materials show exemplary uniqueness and good graphic designs. Enjoy!